I’m sure you’ve heard (and maybe even grown tired) of the One Word craze. I have friends who are lovers of the idea, some who are haters, and some who fall somewhere in between. Since 2009, I have joined the ranks and chosen a word to focus on for the year. This whole idea is freeing for a “get it done” gal like me. I have a tendency to make so many resolutions that it’s ridiculous (probably because I’m a 1 on the Enneagram…always trying to improve myself and make things better). So selecting just one word to focus on is a relief! Some years I’ve made art as a reminder of my word, or purchased a necklace to keep the word close, and sometimes I’ve forgotten the word in the midst of busy life. But this past year, my word ended up turning into a book. Yes, two of my five kids are darling daughters, but that’s not the main reason this word was chosen. For as long as I can remember I’ve acted like a mother…maybe that comes with the territory of being a first born girl. From a young age, I strapped on an ultra-responsible mindset and tried to “oversee” and take care of others (even when they were doing just fine). I prided myself on being dependable (which can be a great quality) but God showed me there was some healing that needed to happen in my try-hard heart. The way toward this healing was learning what it means to be a daughter of God and then walking out that reality. Typically a mother nurtures. And a daughter receives. But I had a receptivity deficiency. For decades, I tried to earn my place instead of enjoying the place I already had. 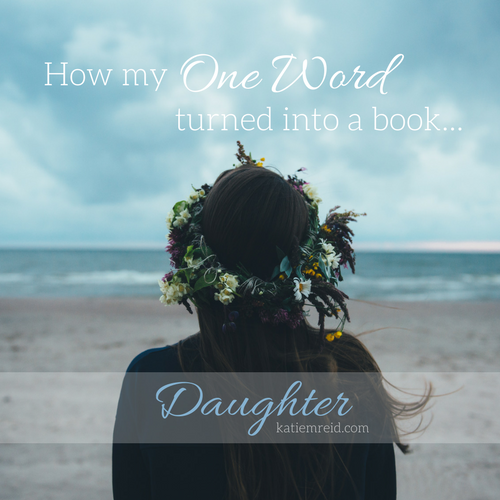 As I explored what it meant to be a daughter, my One Word worked it’s way into my heart and into a book manuscript. I began to see the difference between being a woman who strives to be enough and one who knows, in Christ, she already is. 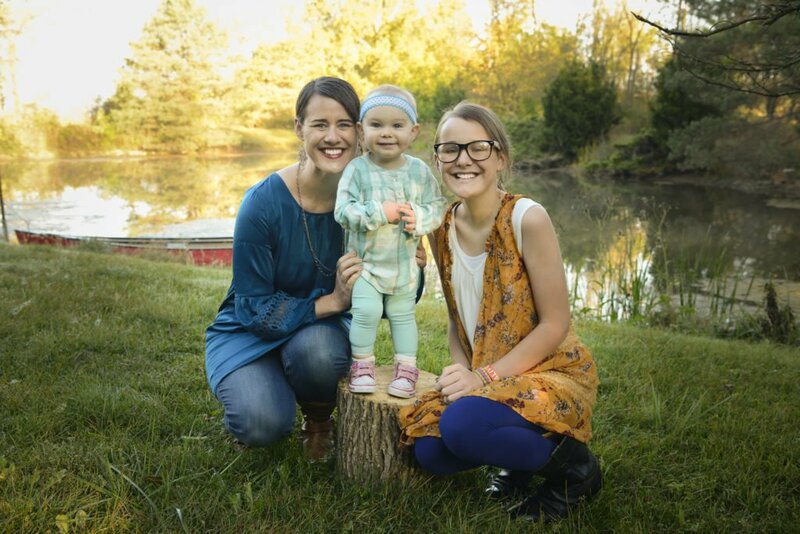 I know lots of strong women—they are some of my dearest friends, but many of them, like me, have experienced difficulties living as a beloved daughter. Taking a closer look at Biblical Martha, we see a woman who gets things done. I can relate! We also see two sides of Martha…one who struggled to receive and one who received better than most. I can’t wait to tell you more about the connection between Martha and the joy of living as a daughter—without compromising your doer’s heart in the process. My book, Made Like Martha: Good News for the Woman Who Gets Things Done, doesn’t come out just yet, but you can read the first chapter here and here. It is available for pre-order too. Now, I’m not guaranteeing your word for the year will become a book, but it might! As we focus on one theme (instead of ten resolutions we’ll probably quit after the first week of January) it begins to work its way into our heart. Even if our word just improves one interaction, or helps us feel more loved, or encourages someone else…I think it’s worth it. Cheers to a fantastic year—living loved and giving love—whether you pick one word or not! 1. Pick a word for the year (or for this season). 2. Reflect on the word. 3. Create or purchase a piece of art to help you interact with the idea behind the word. 4. Walk out the word in a few bite-sized, manageable ways. I’d love to hear what word you’ve chosen! Katie, I love that your one word became a book! For the first time this year, I choose a word – Hope. It makes me feel a lot lighter to have one thing to focus on working toward. : ) Loved your thoughts here! Blessings! Thank you, Leslie. And “hope” is a great work! May 2018 be full of it (hope, that is ;-). Beautiful post, friend! What a blessing to see how God used this shift in your own mind and heart to soon bless others through your published work! Thank you, friend. So excited about your upcoming book! Katie, I’m excited about your upcoming book. It sounds like good news indeed. I loved your newsletter too, by the way, and will head over to its Instagram account to follow it today! The tweet able quote gets me. Letting that soak in today. Powerful, Katie. Hi Jenni- Thank you. Hope you’re having a great 2018 so far! Thank you for sharing your word, Kathy. May 2018 be full of AWE!